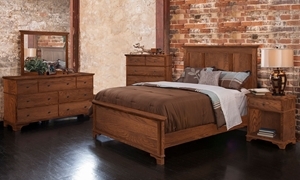 Solid wood king panel bed handmade by Amish and Mennonite craftsmen accompanied by dresser and mirror in a protective finish. 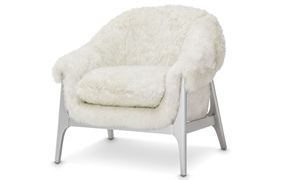 Barrel back-style chair gets a luxe look in faux fox fur with silver metallic yarns over an exposed hardwood frame in a platinum finish. 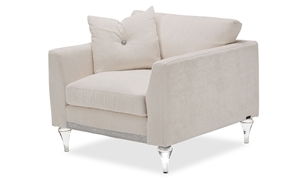 Sit in the lap of luxury on this glitzy flare arm chair with clear acrylic feet, feather blend cushions and a matching toss pillow. 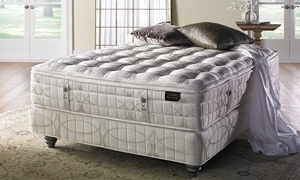 Luxury firm queen mattress handcrafted with zoned nested coils, latex comfort layers, organic cotton and a wool and cashmere quilt. 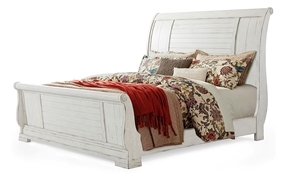 Classic king sleigh bed gets a fresh look with pleasing plank-effect paneling in a distressed chalk white finish. 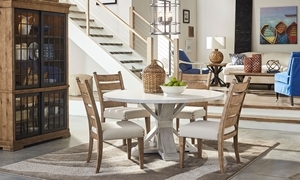 Louis Philippe style gets a comfortable look with the distressed white finish on this king sleigh bed, 8-drawer dresser and mirror. 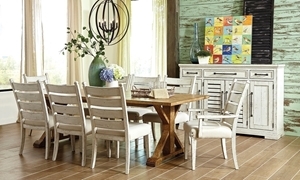 Sophisticated queen sleigh bed gets a light and inviting look with plank-effect panels in a distressed white finish. 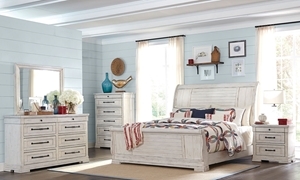 Timeless queen sleigh bed with plank panels accompanied by 8-drawer dresser and matching mirror in a distressed chalk white finish.